Cholangiocarcinoma refers to cancer of the biliary system. It can occur at any site along the biliary tree, although predominantly arises in the extrahepatic biliary system. The incidence is 1-2 per 100,000 population per year in Western society, with over two-thirds of these cases in patients aged over 65 years. There is a higher incidence in South-east Asia due to the association with chronic endemic parasitic infection of liver flukes. 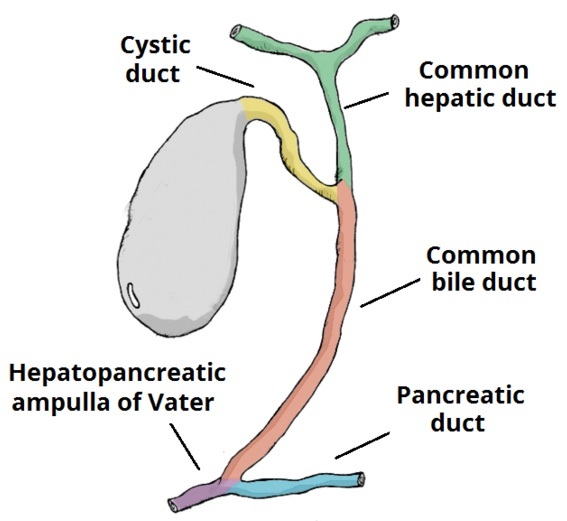 The most common site for bile duct cancers is at the bifurcation of the right and left hepatic ducts (termed Klatskin tumours). They are typically slow-growing tumours that invade locally and metastases to local lymph nodes, before spreading distally to the peritoneal cavity, lung and liver. In this article, we shall look at the risk factors, clinical features and management of a patient with cholangiocarcinoma. Fig 1 – The biliary tree. A Klatskin tumour occurs at the bifurcation of the right and left hepatic ducts. Histologically, 95% of cholangiocarcinomas are adenocarcinomas arising from cholangiocytes within the biliary tree. The remaining majority are squamous cell carcinomas, with other rarer types of bile duct cancers include sarcomas, lymphomas, and small cell cancers. Cholangiocarcinoma (both intra- and extrahepatic) is generally asymptomatic until a late stage in the disease. Symptoms include post-hepatic jaundice and pruritus, with pale stools and dark urine. Other less common features include RUQ pain, early satiety, weight loss, anorexia and malaise. On examination, jaundice and cachexia is often evident. Courvosier’s law can be applied in clinical assessment. Courvoisier’s law states that in the presence of jaundice and an enlarged or palpable gallbladder, malignancy of the biliary tree or pancreas should be strongly suspected as the cause is unlikely to be gallstones. This sign may be present if the obstructing tumour is distal to the cystic duct. The differential diagnosis for cholangiocarcinomas should include the causes of post-hepatic jaundice, such as obstructive choledocholithiasis, bile duct strictures, choledochal cysts, external compression from extra biliary tumour, benign biliary tumours, pancreatic tumours, primary biliary cirrhosis, and primary sclerosing cholangitis. Biochemical investigations will confirm an obstructive jaundice (elevated bilirubin, ALP and ɣGT). Tumour markers CEA and CA19-9 may also be elevated. Ultrasound scanning may be used initially to confirm an obstructive cause. MRCP is the optimal imaging for diagnosing cholangiocarcinoma; ERCP may be used to demonstrate the site of obstruction and also has the ability to obtain samples for cytology/histology. Staging of the disease is best done via CT imaging; it is superior to MRI scanning for locating distant metastases and can further evaluate the level of biliary obstruction. Angiography may be used in pre-operative planning to image the hepatic arteries or portal vein. If encasement is demonstrated, any surgical intervention is unlikely to be successful. Staging is based on the TNM classification, with some variations depending on whether the tumour is intrahepatic, hilar, peri-hilar or distal. The definitive cure for cholangiocarcinoma is complete surgical resection*. However, the majority of patients have inoperable disease at the time of presentation with only 10-15% suitable for surgical intervention. Intrahepatic and Klatskin tumour resection requires a partial hepatectomy and reconstruction of the biliary tree. Patients with distal common duct tumours require a pancreaticoduodenectomy also known as a Whipple’s procedure. Radiotherapy may be used in some cases as adjunct or neoadjunct therapy. There is limited evidence at present for the use of post-operative chemotherapy. Stenting: ERCP may be used to stent the bile duct and relieve obstructive symptoms. Self-expanding metal stents offer the best outcome but are prone to occlusion and may need replacing frequently (every 3-4 months). In cholangiocarcinoma, the risk of biliary tract sepsis is increased (due to the biliary obstruction). Secondary biliary cirrhosis occurs in 10-20% of patients. In patients undergoing aggressive surgery, 5 year survival rates are 10-40%. Survival appears to be better for distal tumours compared to those involving the upper third of the biliary tree, which carry the worst prognosis. What is the most common histological subtype of cholangiocarcinoma seen?